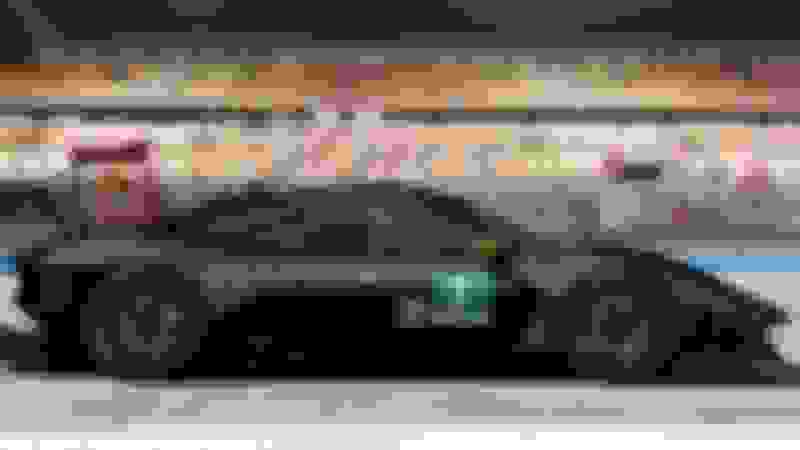 Under the carbon fiber skin is a naturally aspirated 5.4-liter V8 making 700 horsepower and 492 pound-feet of torque. That engine sounds pretty remarkable, too, based on the sound sample the company released earlier. It's paired to a six-speed sequential transmission, and it powers the rear wheels exclusively. An enormous rear wing is capable of providing 2,646 pounds of downforce, which is over 500 pounds more than the car's weight of 2,143 pounds. Stopping the featherweight supercar are disc brakes with six-piston calipers at all four corners. 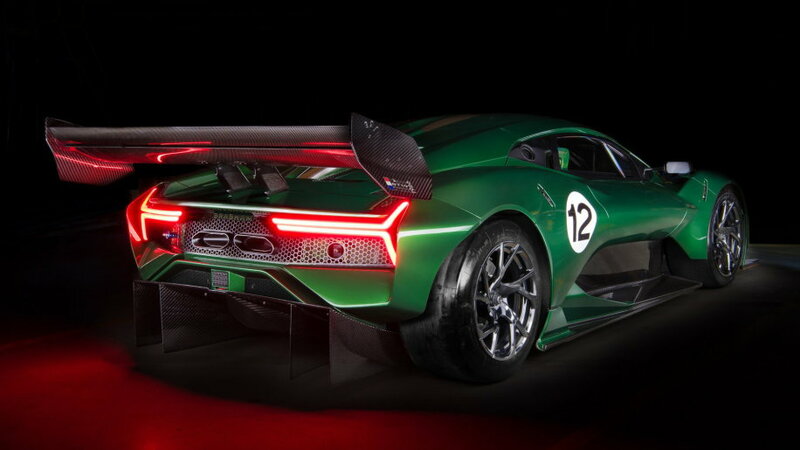 Brabham will only build 70 of these cars, and they'll sell for about $1.4 million. The first 35 will wear color schemes based on race-winning Brabhams of the past. New owners will get training on how to drive it, and deliveries begin later this year. 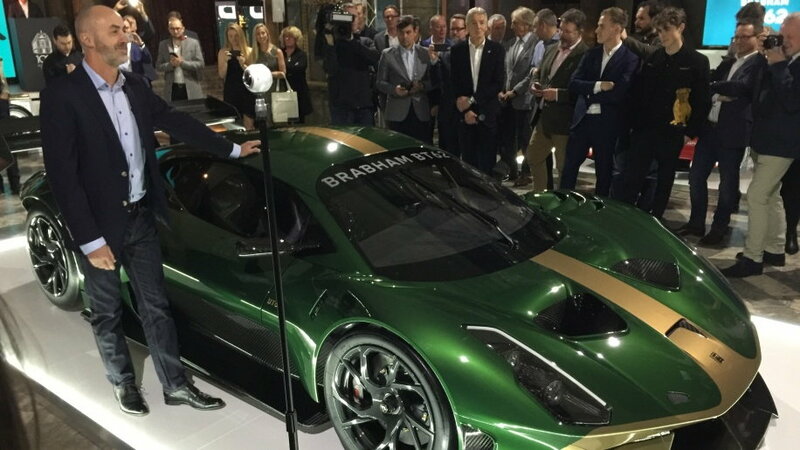 "We didn't benchmark anyone else," Brabham Automotive's director of technology and engineering, Paul Birch, explained to Autoblog at the reborn motorsport brand's exclusive BT62 supercar unveil in London last night. "We had finished our car by the time the McLaren Senna came out, and we're looking forward to their next car challenging ours," he added with a cheeky smile. Why is he so confident the Senna can't match the BT62? In simple terms, it's because the 710 horsepower, 5.4-liter V8 Brabham BT62 is lighter than the Senna (2,143 vs. 2,641 pounds, dry weight), has a better power-to-weight ratio (730 hp vs. 668 hp per ton) and offers way more maximum downforce too (2,646 vs. 1,764 pounds). 0-62 mph times and top speeds aren't listed yet, but Brabham Automotive is positive that its first commercially-available car, has met its internal brief, which Birch confirmed was, "a GT racer without restrictions, aimed at endurance sports car racing." The $1.4 million car (before local taxes and options) will take 7-10 months to build and is not road-legal. 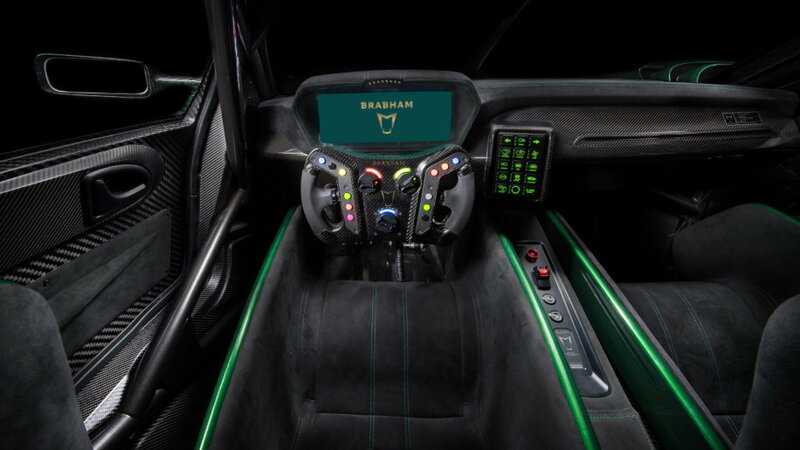 Brabham is instead seeking owners who want to improve their track day performance through individually-tailored driver programs which, through a high-tech software partnership with Microsoft, will be able to measure each customer's biometrics and even emotional racing health (as well as track times). 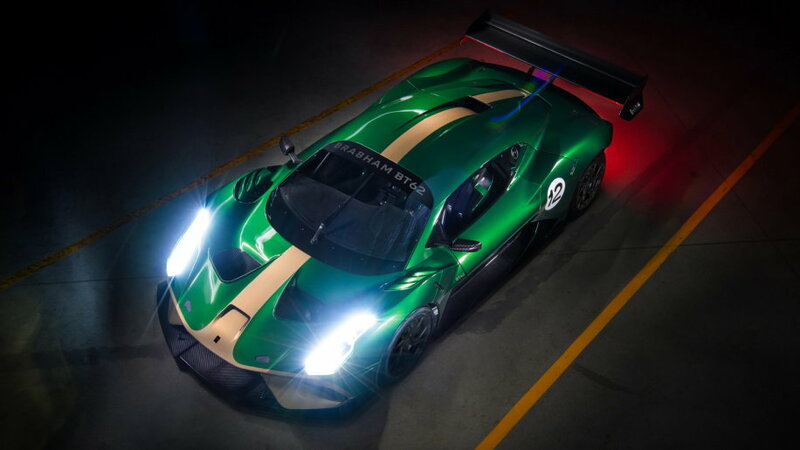 The BT62 will be limited to 70 examples — to commemorate the 70th anniversary of Sir Jack Brabham starting his racing career in Australia back in 1948 — the first 35 of which will be painted with the livery of each of the 35 Grand Prix victories the Brabham team enjoyed in its 30 years of Formula One. 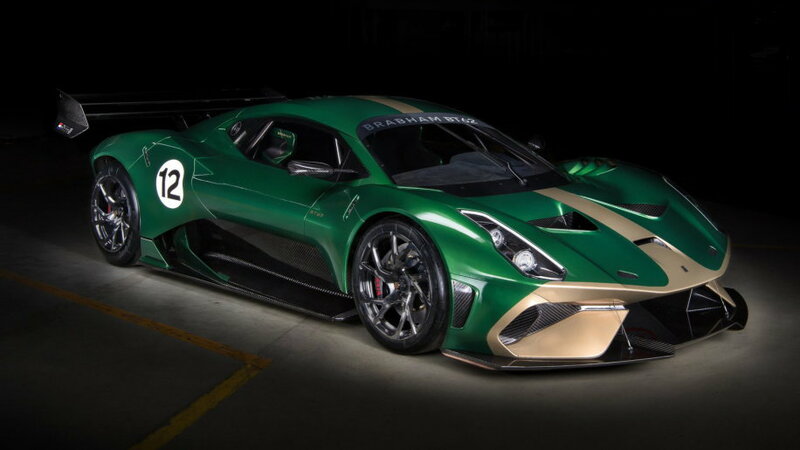 Shortly after announcing the BT62 supercar's new road-legal package, which also adds some driver comforts, Brabham Automotive has announced its racing intentions. The Australian manufacturer will be taking part in the 24 Hours of Le Mans and the World Endurance Championship in 2021-2022, in the GTE class. The GTE car will be based on the BT62 chassis. Stock, the BT62 comes with a 710-horsepower 5.4-liter V8. There's an interesting sideline to the news: As the BT62 debuted as a track-day car first and a road car second, early Brabham customers have become part of the BT62's track testing team. It's often said that with some cars, customers become sort of beta testers during early production — with Brabham's supercars, the aspect seems rather more voluntary. In any case, the endurance racing program is "directly linked" to Brabham's BT62 Driver Development Program, which also gives owners Pro-Am racing opportunities. Sir Jack Brabham won the French Grand Prix at Le Mans in 1967, so the name has definite history there. David Brabham, the company's managing director and lead test driver, also won at Le Mans in 2009, with a Peugeot908, and his brother Geoff took the honors there in 1993 driving a Peugeot 905. David Brabham says: "Returning the Brabham name to Le Mans is something I have been working on for years, so it's fantastic to make this announcement today. Brabham Automotive only launched its first car, the BT62, in May 2018, so we have a long road to travel to earn the right to return to compete at Le Mans. That work starts now with a long-term racing commitment. We look forward to developing the BT62 and future products while building a world-class competitive race team around the leading engineering and manufacturing talent we have in the business." Brabham also stated that the company intends to compete in a lower-level racing series in the future. New Ford Rangers starting to arrive in D.C. area.